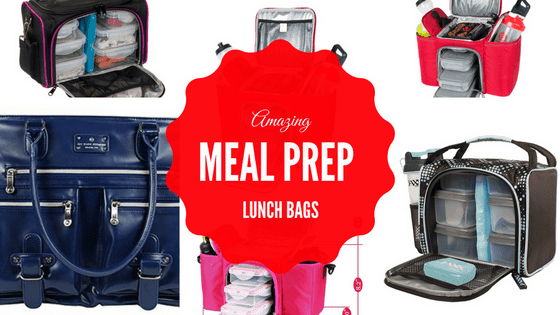 Meal prep lunch bags are great for anyone who is in to clean eating but spends a lot of time outside out of the home! Whether it’s at work or running errands all day, having your meals insulated and always on you will help you stay on track and avoid fast food lines. 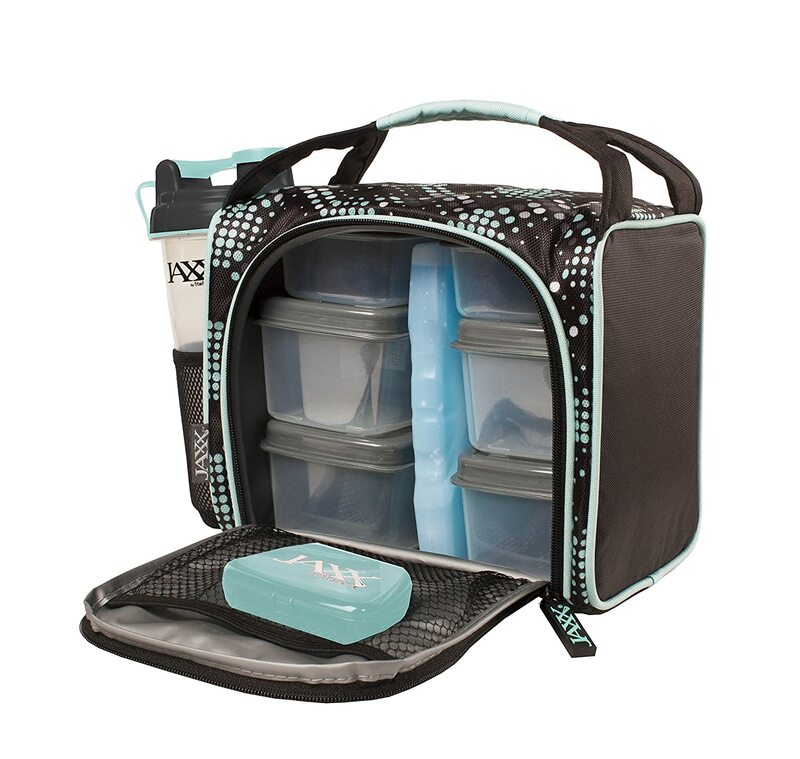 The Jaxx FitPak is a gorgeous meal prep lunch bag that is perfect for work or long trips with the kids. It comes with the insulated lunch bag, ice pack, 6 microwaveable portion control containers, a pill box and a shaker bottle. So even if you don’t have a fridge to keep your bag in, your food will still stay nice and cool! 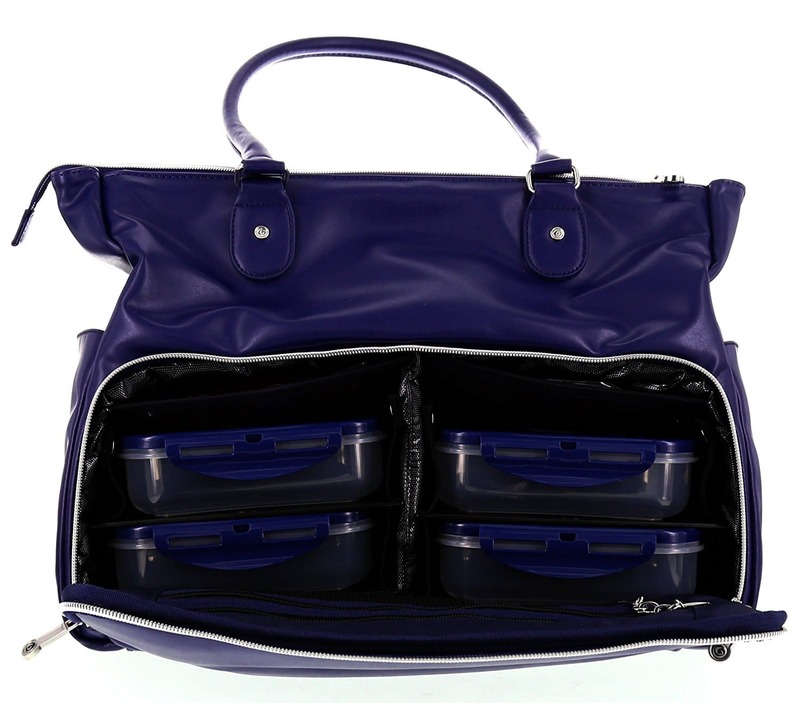 With the 6 containers, you can hold your 2 full meals and 2 snacks. Again, it’s PERFECT for an 8-10 hour day! It does all of this without being much bigger than an average lunch bag that doesn’t offer any of these benefits. The Jaxx FitPak also comes in 7 different colors and is super budget friendly! The Lish Meal Prep Lunch Bag is a bit bigger than the one above, but it’s still small enough to fit in an average fridge. This bag being bigger means the containers are also bigger to fit bigger meals. You can open this bag two ways, from the top or front. The six pack of portion control containers are BPA-free, as well as dishwasher and microwave safe. 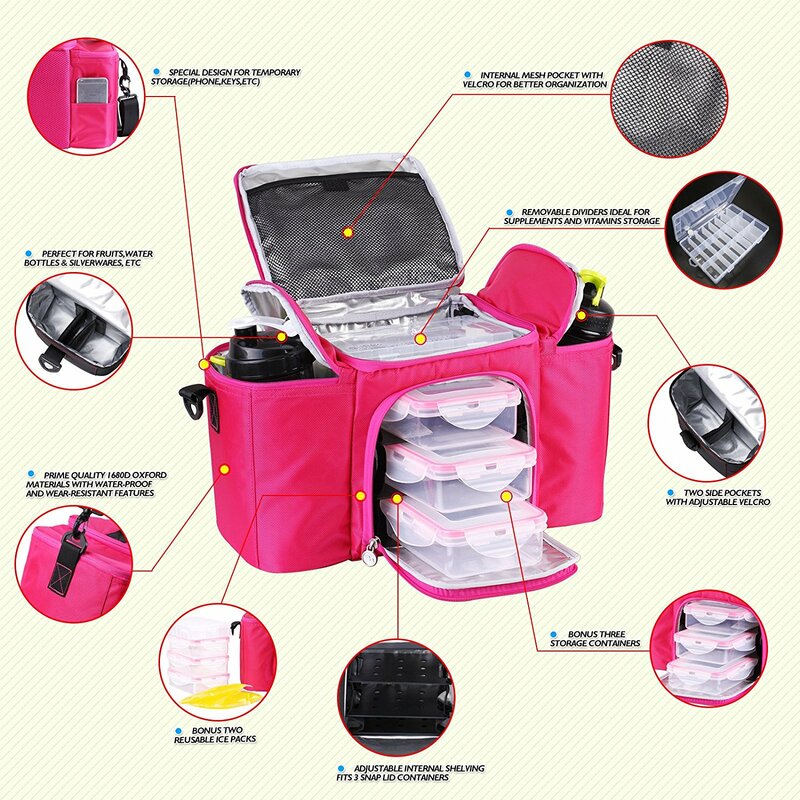 The large inner compartment can comfortably hold all 6 included food containers and the ice pack, while the side mesh pockets hold shaker bottles or water bottles for easy and convenient access. The RitFit Meal Prep Lunch Bag is one of the larger meal prepping bags and fits a ton of stuff. It will not fit in an average sized fridge, but it will keep your food cool all day and warm up to 3 hours! This bag comes with 3 full sized meal prep containers that can hold 3 full meals. It also comes with insulated side pockets. You can hold lots of snacks in one of the side pockets and 2 bottles on the other! The bag also has pill dividers at the top that are great for any vitamins or supplements you may be taking. 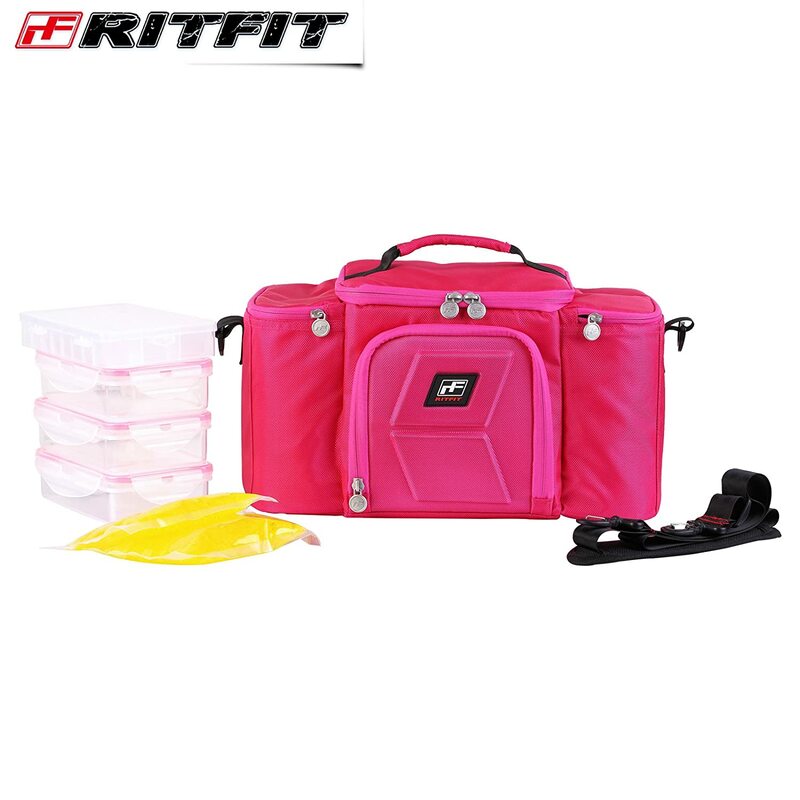 The RitFit Meal Prepping Bag is perfect for being out all day or for someone who requires a lot of calories. This is great for fitness pro’s! 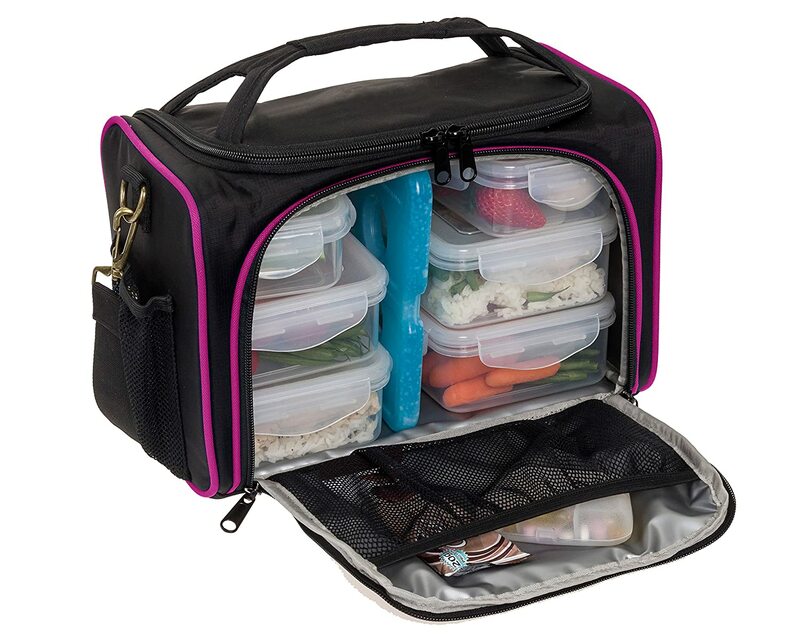 The RitFit Meal Prepping Bag comes in both pink and black, so it’s perfect for any style! The Innovator bag is a fully insulated sports nutrition and meal management bag with two reusable freezer gel packs that help keep meals cold for eight hours! 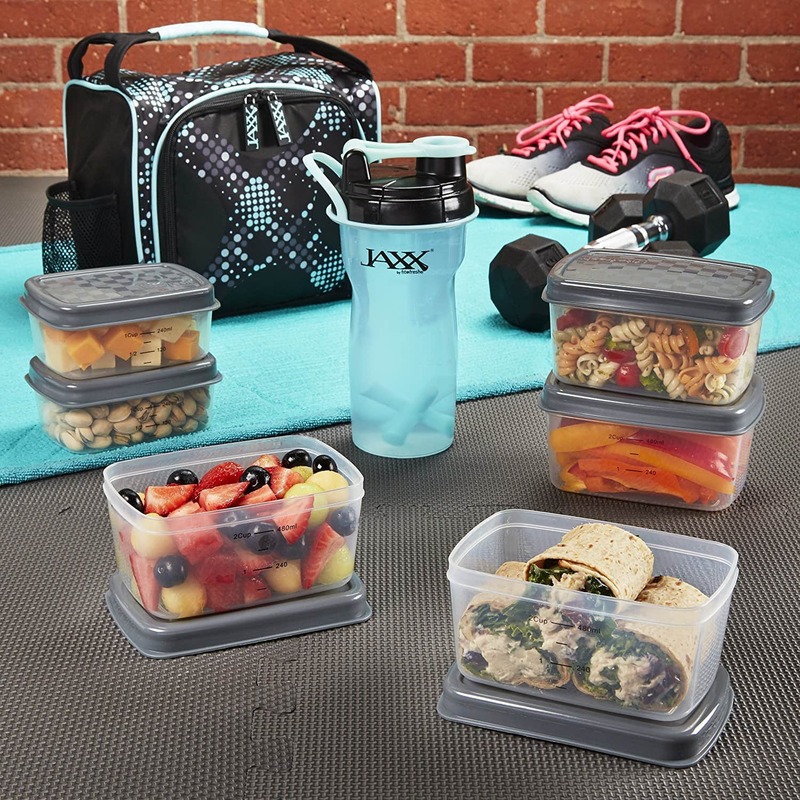 The bag includes 3 leak-proof, microwave/dishwasher safe, BPA-free Snap Lid Containers and one Sports Nutrition Container for organizing nutrition supplements. You also have the option to buy the larger bag that holds 5 of the meal containers! It also comes with two adjustable insulated side pockets that fit up to four water/blender bottles or fruit/veggies/other snacks and utensils! ==> Need to hold even more meals while you’re out? Check out Innovator’s 5 meal bag! Yes ladies, a meal prep purse does exist! And it’s absolutely stunning and convenient! Instead of carrying around both your purse and lunch bag, you have an all in one right here! 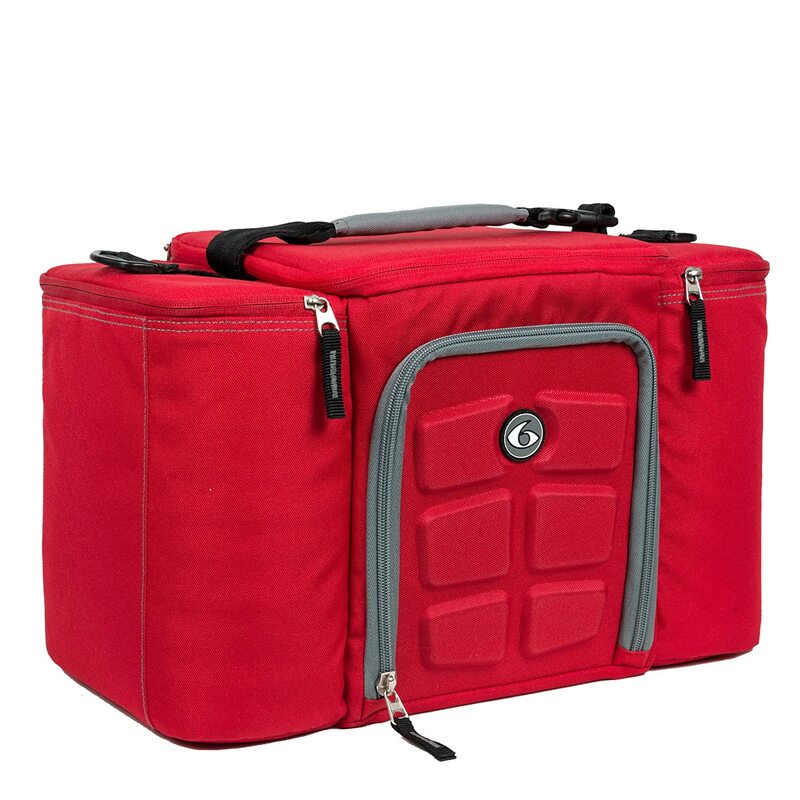 This meal prep purse can hold 4 meals with 2 ice packs in to it’s insulated compartment, keeping them cold for up to 8 hours. But the beauty of this bag is that it also has a compartment for your utensils, supplements, laptop, wallet, keys and phone! 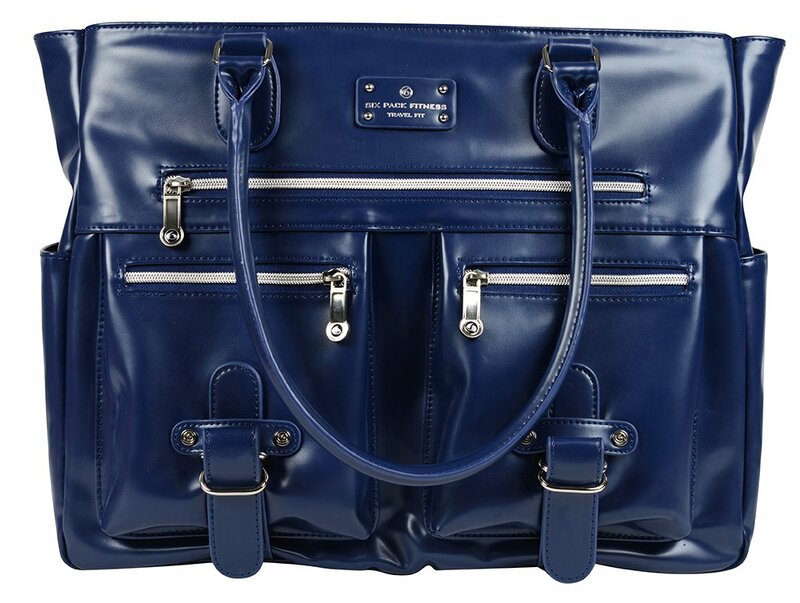 It also has a large main compartment that can basically hold anything you would regularly carry in your purse, work or gym bag! This meal prep purse is a must have for all ladies! !